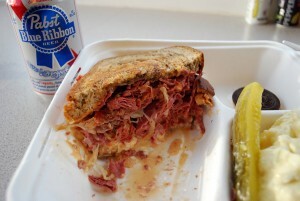 About a year ago, I searched Google for the best Reuben sandwich in Seattle. The list popped up on Yelp and the top option at the time was a place called Market House Meats. For some reason I never followed through with a visit, but Market House Meats always stuck with me. Finally, after a year of holding on to the idea, I stopped into Market House Meats to check the place out. Market House Meats (1124 Howell St.) doesn’t look like much from the outside (or the inside for that matter), but they’ve been serving Seattle since 1948. It started out as a meat market and still operates in that capacity today, but they added a deli in 2005. 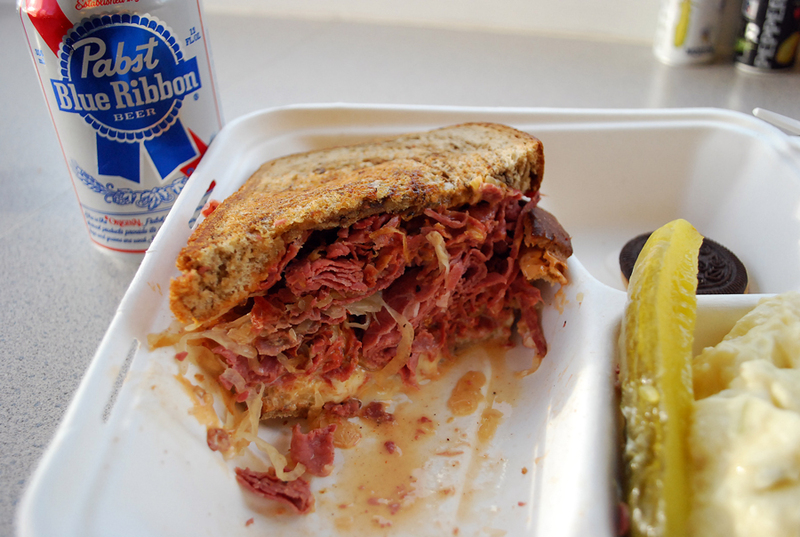 On top of Reuben sandwiches (and normal corned beef), Market House Meats also serves pastrami sandwiches (and pastrami dips), BBQ brisket, Philly cheese steaks, brats, and Irish chowder. I came to Market House Meats for the Reuben, so that’s exactly what I ordered. Before I even paid, I watched the guy start making my sandwich. 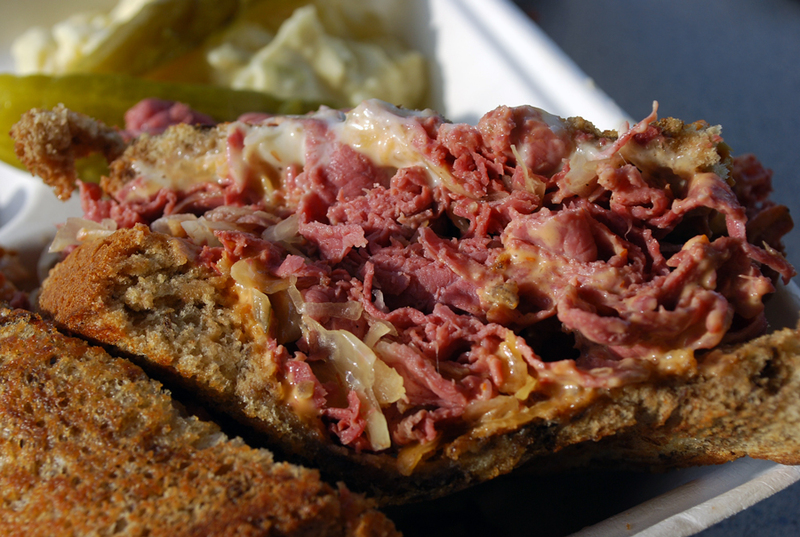 He dug his hand into a container and pulled out a handful of sauerkraut, and then he followed that up with a heaping mound of Market House Meats’ signature corned beef. It was late afternoon so I was the only customer in the place, but I thought to myself, “There’s no way that’s all for my sandwich.” Well, it was. 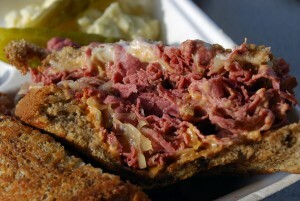 A Reuben sandwich at Market House Meats is piled high, covered with Swiss cheese and thousand island dressing, and stacked on a marble rye bread. It’s also served with pickle spears, potato salad, a cookie, and a side of horseradish — all for $8.95. 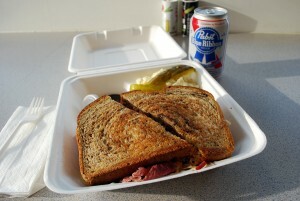 The Market House Meats Reuben sandwich lived up to the hype. It was huge and delicious (even better when dipped into the horseradish, in my opinion). It’s really juicy, but they use thick, grilled slices of rye, so the sandwich never gets soggy. I’m a big eater, but I even struggled to finish the whole thing. I’m embarrassed to say this, but even though I was filled to the brim, I practically licked my container clean. 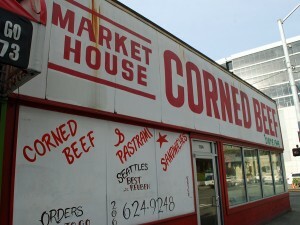 The corned beef is so good, I couldn’t bear the thought of any going to waste. There are plenty of awesome Reuben sandwiches around Seattle (trust me, I’ve tried a few), but Market House Meats easily serves one of the best. It tastes great and you get a lot of bang for your buck (again, the sandwich is HUGE). It was pretty quite when I was there, but I hear the line stretches out the door at lunchtime. If you haven’t checked this place out — now is the time. I regret waiting a year to give it a shot. Have you ever eaten at Market House Meats? What did you order? How was your meal? We’d love to hear all about it! Please leave a comment below or connect with us on Twitter, Facebook, and Google+. Don’t forget to also check out Seattle Bloggers for more great places to experience in the Emerald City. WOW, that seriously looks delicious. 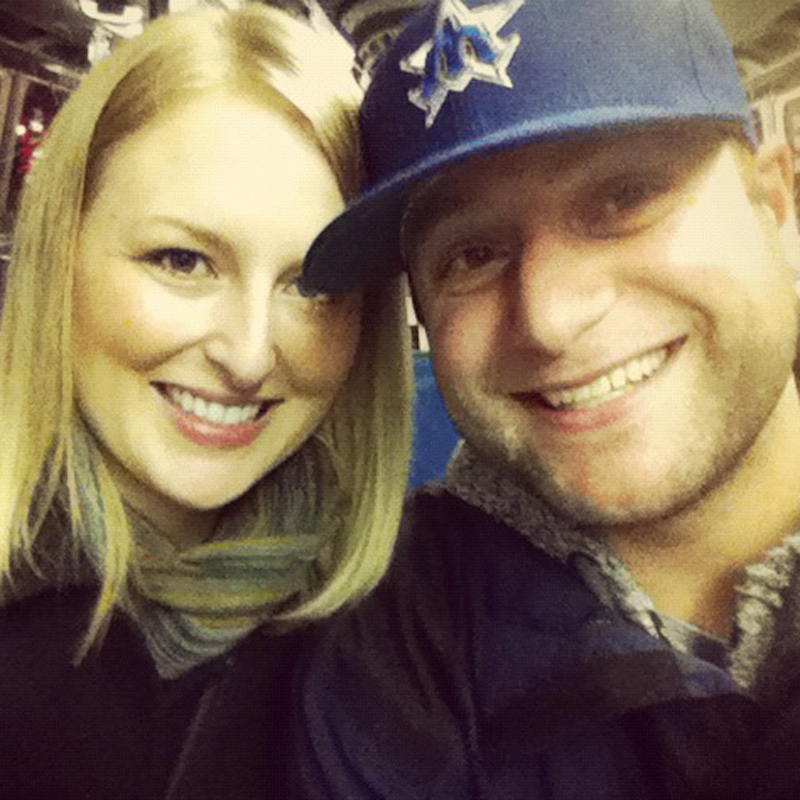 Bookmarked your blog for when I hit Seattle!